The first thing to understand is that there are several different kinds of omelette – a frittata, for example is a non-fluffy omelette, while what we order in a restaurant is usually a fluffed omelette and the final variety is the soufflé omelette which is a complex blend of culinary skill and chemical effects of certain foodstuffs and shouldn’t be attempted until you can produce a fluffy omelette 100% of the time. The key to a fluffed omelette is two-fold – one component is beating the eggs: the more you beat the light the omelette becomes (a soufflé omelette involves beating the white separately and folding in the yolk, amongst other things) and the less you beat, the more solid an egg mix you’ll end up with. The second component is your pan. To make a perfect omelette you need good non-stick frying pan with a solid bottom – ideally a pan that is used for nothing but making omelettes. Size also matters a lot – the larger the pan, the more difficult it is to pull off a perfect fluffy omelette. The ideal size is 20cm (eight inch), which is big enough to make a two egg omelette. Once you’ve master that you can move up to a 25cm pan, which makes a 3.5 egg omelette. If you can cook your omelette over gas, you have a real advantage because it allows for a swift reduction of cooking temperature when required. If you don’t use gas, try heating two rings, one to medium and one to low, so that you can swap the pan between them. Make sure that all your ingredients are ready before you start cooking. If you are adding cheese make sure it is grated, if you want tomatoes make sure they are sliced before you begin. An omelette will flatten if you make it wait for ingredients to be added. 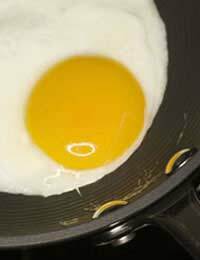 Season your pan with half a teaspoon of unsalted butter and a drizzle of olive oil and before you add any eggs, run a little cold water onto your fingertips and flick them over the surface of your pan – if the droplets sizzle gently, your pan is at the perfect temperature. If they sizzle wildly the pan is too hot, if they lay there, the pan is too cold. When the temperature is right, add the beaten eggs. After around a minute push the edge of the omelette up, allowed the fluid part to run underneath, repeat all round the pan. While the top of the omelette is still just moist, flip it over. An omelette is not a pancake, you don’t throw it in the air, just slide a wooden spatula under the edge and turn the food over gently. At this point you can add your other ingredients to the well-cooked former underside of the omelette and, using your spatula, fold the egg mixture in half. Reduce the heat slightly (or move to the other ring for electric cooking) and cook for minute before turning the omelette again so the former top is now the bottom. Folding the omelette adds to the fluffiness of the texture. Cook for another minute, then slide onto a plate and allow to stand for a minute in a warm place before serving. This recipe is quite different to the standard omelette recipe because it contains sugar which gives the omelette a much higher risk of catching or scorching – it really is a dish you can’t take your eyes off for a second, but it’s worth it. Whisk the eggs, egg white and sugar together in a large bowl until golden and smooth. Heat the vegetable oil in a small frying pan then add the egg mixture and fry for two minutes on each side, flipping with a large wooden or plastic spatula. Remove from heat and either place on a serving plate with compote or cherries in the centre and the outer edge dusted with sugar, or fold in two over the filling and decorate the top with a couple of pieces of fruit dipped in icing sugar.